The key visual for the movie. 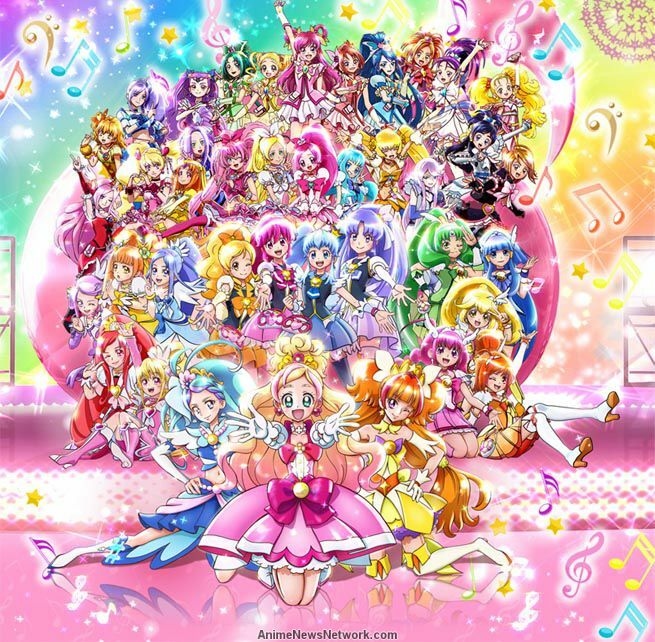 Pretty Cure All Stars: Spring Carnival is a 2015 anime film based on the Pretty Cure franchise of magical girl anime. The story focuses on the characters from all of the series made up until that point (from Futari Wa Pretty Cure to Go! Princess Pretty Cure) being invited to a song festival in the land of Harmonia. As the film is based on music, the film uses several songs from the franchise and two original songs, one of them being "Ima Koko Kara", which translates into "Right Here, Right Now", which has two versions: one sung by the Pretty Cures at the climax of the film, and one played over the credits of the film performed by the idol group Morning Musume. However, the film's teaser trailer, which first played after HappinessCharge Pretty Cure The Movie: The Ballerina Of The Doll Kingdom, uses a third version of the song that appears to be sung by some of the Pretty Cure series' theme song artists. This version was possibly dropped from the movie because of the Morning Musume version mentioned above. It is unknown if the full version of this track will be released. The teaser trailer, which features a snippet of the lost song. (begins at 0:24). The scene in the movie featuring the version of the song that the Pretty Cures sing. The end credits of the movie, featuring Morning Musume's cover of the song.